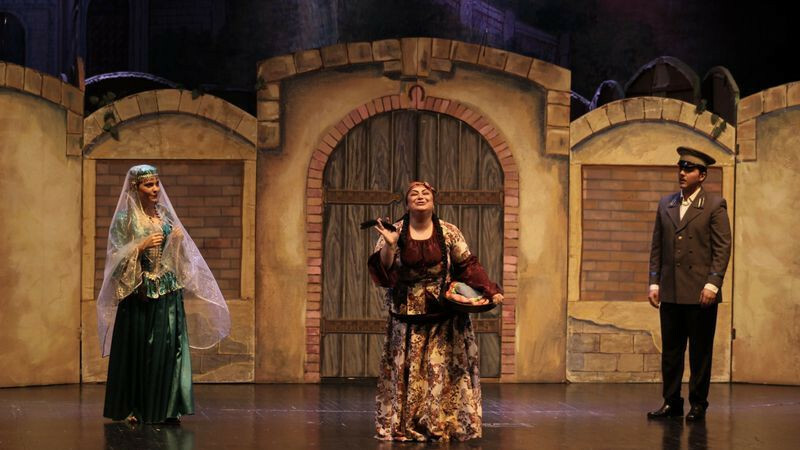 If Not That One, then this one in Azerbaijan State Musical Theatre buy tickets online. Delivery of tickets for the event If Not That One, then this one. "If Not That One, then this one"
The founder of the national operetta genre –Uzeyir Hajibayli’s “If Not That One, then this one” was written in 1911 and has been repeatedly performed by various theater troupes. The events in the operetta cover the period early of twentieth century, when women's rights were violated and they were exploited by merchants, owners and grooms. Main character of the work – trader Mashadi Ibad is the typical representative of such owners. His desire to marry young Gulnaz, competing with intelligent, young and modern Sarvar has made him target of laugh by the author. In fact, what makes Mashadi Ibad to marry her is not only his wealth but also Rustam bay to lose all his money at gambling - who is the father of Gulnaz. He agreed to give her daughter to this old, wealthy man to strip more money from him. Throughout the work both Mashadi Ibad and his “intelligent”, cheat and only own profit seeker circle’s disguise is clearly opened and showed very skillfully, thus this way society takes a step to get rid out of its past. Successfully demonstrations of “If not that one, then this one” operetta laid it to be written in golden letters in the history of Azerbaijan theater and played a great role in the development dozens of young actors.